I'll have the charts, with a side of charts. Oh, and can you include extra charts on that? Anyone who regularly follows my Foolish articles will see that there are two things I'm rather fond of: Apple (Nasdaq: AAPL) and charts. I've compiled more than 10 years of operating data on the Mac maker, starting with the first quarter of fiscal 2002, the fiscal quarter when the iPod was launched -- and I'm happy to share my findings with you, my Foolish reader. Let's take an illustrative trip down memory lane and see the inner workings of Apple's meteoric rise to become the largest company in the world over the past decade. Macs are no longer the show stealer, but they were once the core of Apple's business, so they're as good a place to start as any. Sources: SEC filings, earnings press releases, Apple investor relations. You can see here that as Apple's Mac business grows in terms of unit sales and revenue, that growth is being driven more by laptops than by traditional desktops. 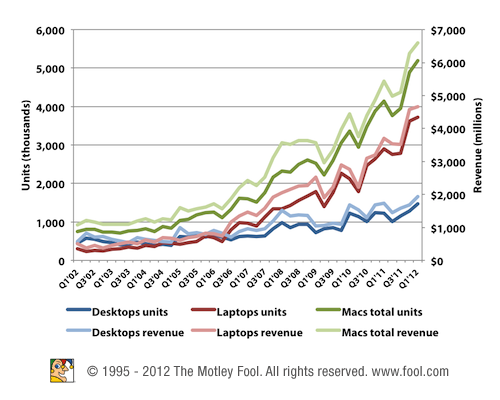 There's no doubt that Macs have exhibited healthy growth overall over the past decade, but as you'll soon see, it's nothing compared with the main course of iDevices. 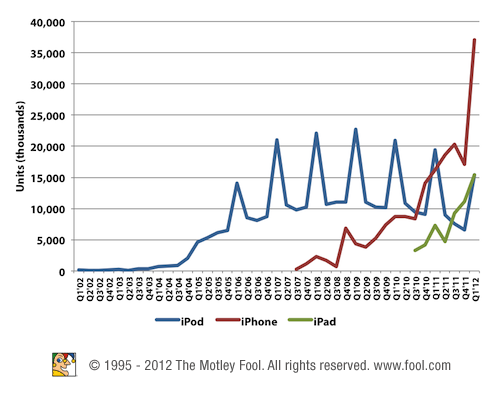 I'll present these a little differently, starting with the unit-sales data for the iPod, iPhone, and iPad. If you thought the iPod was a massive success -- and it was -- you'll see just how much more promising Apple's newest product families are. This chart is interesting in a couple ways. 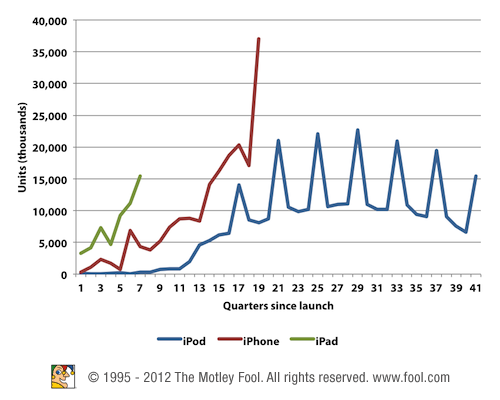 It shows that the obvious iPod cannibalization set in shortly after the iPhone's introduction as sales pick up. You can also see how long it took for iPod adoption to really accelerate; it took three years to break the 5 million unit quarterly-sales threshold. It took the iPhone only six quarters to break the same level, the iPad just three. Indeed, this is what happens when I scoot each of those lines over to the same starting point. You can see here just how much faster iPhone and iPad adoption has been compared with the hugely successful iPod, with the most recent product family -- the iPad -- seeing the fastest start out of the gate. The iPhone and iPad also appear relatively insulated from seasonal effects in their upward trajectories, while the iPod's jagged winter spikes -- not the ones you put on your tires for snow driving -- are readily apparent. 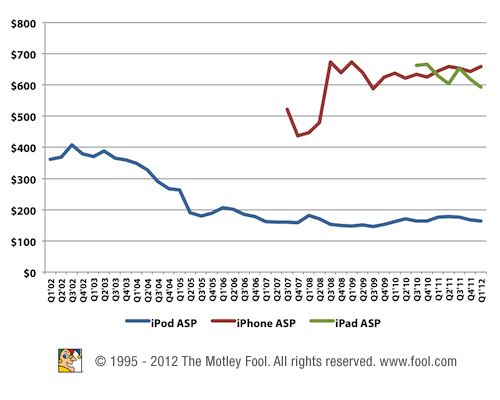 Importantly, iPhones and iPads also seem more resilient to declines in average selling prices, or ASPs. The iPhone ASP was erratic in the beginning as Apple wasn't sure how to price the new device. It launched for $499 / $599 for 4 GB / 8 GB models exclusively on AT&T (NYSE: T). Just two months later, the price dropped by $200, ridiculing early adopters and prompting enough backlash for Steve Jobs to pen an open letter, offering to split the difference with a $100 store credit as consolation. The second iteration, the iPhone 3G -- which was still exclusive to Ma Bell -- adopted the common carrier subsidy pricing model, helping to boost and stabilize ASPs as the iPhone fell in line with the rest of the smartphone industry. In the coming years, consumer demand would force carrier demand, and Verizon (NYSE: VZ) and Sprint Nextel (NYSE: S) now offer the device. Verizon recently took a 5% sequential hit on margins, in large part because of the iPhone, while Sprint is committing to $15.5 billion in iPhone purchases over the next few years. So not only are the iPhone and iPad off to a stronger start, but their revenue generation capabilities are also more potent and promising than the iPod. It's a good thing Apple won't need to worry about what it would be like without them. In addition to these charts, here are some extra interesting tidbits from the data. Sources: SEC filings, earnings press releases, Apple investor relations. Cumulative time frame spans from Q1 '02 to Q1 '12. Since the time frame in question spans the entire existence of the iPod, iPhone, and iPad, these figures represent lifetime digits for those product families, while Macs obviously go way back. 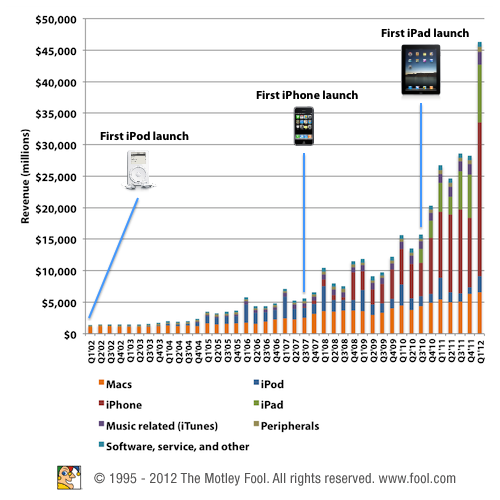 In seven quarters, the iPad has generated 60% of the revenue that the iPod has in more than 10 years. I'll finish with one last chart of good old revenue, broken down by segment with notable launches over the years. Sources: SEC filings, earnings press releases, Apple investor relations. Product images from Apple.com. It's been quite a decade for shareholders, as last quarter's revenue was more than 33 times as large as the same quarter 10 years ago. If the next decade can be even half as good under CEO Tim Cook, then investors have a lot to look forward to, including a trillion-dollar market cap. Apple's market cap isn't the only thing that will reach a trillion; the mobile revolution will, too. Apple is just one way to capitalize on the rise of smartphones and tablets, and The Motley Fool has uncovered another one that's powering the gadgets from the inside. Get the free report now.